The topic of racial identity at universities has been much discussed in recent weeks, with the creation of the I, Too, Am Oxford blog, in which students of colour speak out against problematic assumptions they have faced from white students. The project was inspired by I, Too, Am Harvard, and groups at many other universities have recorded their own responses in order to increase the visibility of students of colour in higher education. We have been inspired by this burst of activity to celebrate the lives and careers of Rhodes women of colour. In this list, we highlight a number of women Rhodes scholars, from a variety of fields, including politics, business, journalism, and the non-profit sector. This list is not a ranking; it is simply a collection of notable Rhodes women of colour. To showcase those who have developed varied and accomplished careers, we selected Scholars who matriculated in or before 1995. Rukmini Banerji is an Indian educator and lobbyist. She is currently on the leadership team at Pratham, India’s largest NGO for the education of underprivileged children. 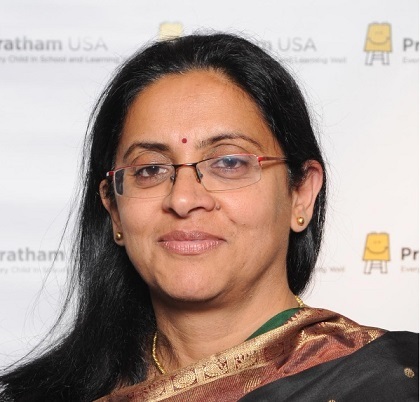 In 2005, she started the National Status of Education Report, India’s only nationwide survey of children’s literacy and education, and in 2010 she won the Kravis Award for Nonprofit Leadership. Rukmini studied Politics, Philosophy and Economics at Oxford and then went on to study Economics at the University of Chicago before moving back to India. Karen Stevenson is an American lawyer. She currently works for Buchalter Nemer in Los Angeles, and was named one of LA’s top 100 Women Litigators by the Women’s Lawyer Association. She was the first black woman to receive a Rhodes Scholarship, and only the eighth black Rhodes Scholar since its inception in 1903. She now serves as a Trustee for the Rhodes Trust and was the Rhodes Secretary for California and Arizona in 2011-2012. As a Rhodes Scholar, she studied French and Russian literature. Anita Mehta is an Indian physicist and academic. She is a pioneer in studying the physics of granular materials, and until recently served as India’s first Science Ambassador to the United States. She is currently a Professor at the S N Bose National Centre in Calcutta. As a Rhodes Scholar she studied Physics, and then worked in labs in New York and Cambridge before moving back to India where she lives with her daughter Tanya. Amrita Cheema is an Indian journalist of Sikh origin. Since 1999, she has been working for the German international broadcaster Deutsche Welle, where she hosts the English language version of their television news program, The Journal, and worked on Deutsche Welle’s highly acclaimed documentary, The Truth Is In No Hurry. Before moving to Germany, she was an editor and anchor of Star News Sunday in Delhi. While at Oxford, she studied Modern History. Lucy Banda Sichone was a Zambian human rights activist and lawyer. She co-founded the Zambian Civic Education Association (ZCEA) in 1993, and held the position of Executive Director until her death in 1998. She helped to form the ZCEA in order to promote democratic values and civic education following a series of democratising political reforms in Zambia, and the organisation continues to promote political awareness. As a Rhodes Scholar, she studied Politics, Philosophy & Economics. Nnenna Lynch is an American economist and policy consultant. Most recently she the Senior Policy Advisor on economic development to former New York mayor Michael Bloomberg, where she led a team working to create jobs and strengthen the city’s economic base. Previously, she worked at Goldman Sachs and at a small, mission-focused, for-profit real estate company focused on distressed neighbourhoods. Outside her professional and academic career, she has also achieved success as a competitive runner: she won a gold medal for the United States at the 1997 Summer Universiade. As a Rhodes Scholar, she studied Social Anthropology. Adhiambo Odaga is a Kenyan philanthropist and non-profit director. This year, she became Managing Director of the Dangote Foundation, the charitable arm of a Nigerian trading conglomerate, which organises interventions in health and education and provides relief for victims of natural disasters. Previously, she worked for 12 years as the West African representative of the Ford Foundation. She was Kenya’s first Rhodes Scholar. Maxine Williams is a Trinidadian lawyer. Currently she is the Global Head of Diversity for Facebook. Previously, she worked as the Director of Diversity at the international law firm of White & Case. As a lawyer, she has represented clients in civil and criminal courts both in the UK and her in her native Trinidad. She has also worked as a television host, an actress and a professor, teaching law at the University of the West Indies. In 2013 she was included in Ebony Magazine’s Power 100 list. As a Rhodes Scholar, she studied Jurisprudence. Shazia Azim is a Pakistani finance consultant. As a Rhodes Scholar she studied Politics, Philosophy and Economics, and then went on to study at the London School of Economics before embarking upon a 25-year career in finance and consulting in London. She is currently a Partner at PricewaterhouseCoopers, where she specialises in risk, capital and insurance. Salma Omar is a Pakistani economist and development expert. Currently, she is Senior Social Development Specialist at the World Bank, and works on development initiatives in conflict-ridden regions of Pakistan. She has previously worked at UNICEF, the Department for International Development and the World Wide Fund for Nature. As a Rhodes Scholar, she studied Politics, Philosophy and Economics. She was the first woman awarded a Rhodes Scholarship from Pakistan.